H 3626 - Casement or Projecting Window 4 Bar Hinge, 8 inch, Stainless Steel, 1 pair per pkg. H 3627 - Casement or Projecting Window 4 Bar Hinge, 10 inch, Stainless Steel, 1 pair per pkg. 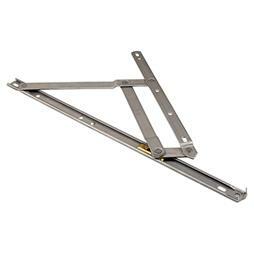 H 3628 - Casement or Projecting Window 4 Bar Hinge, 12 inch, Stainless Steel, 1 pair per pkg. H 4103 - 14 inch 4-Bar Casement Hinge, Non-Handed, 1 per pkg. H 4104 - 16 inch 4-Bar Casement Hinge, Non-Handed, 1 per pkg.